So far, I’ve had a mindful ten minutes in each of the past 101 days. I’ve almost made it part of my daily routine in the morning. Wake up, use the bathroom, take the dogs out, feed the dogs, meditate while they eat. It’s helped me be even-keeled throughout the day and not worry about work first thing in the morning. Even though I’m still bad at clearing my mind, I’m slowly getting better. I’m starting to consciously realize when I’m feeling stress or anger, and I am better at nipping those emotions at the bud. I’m not perfect, but better. 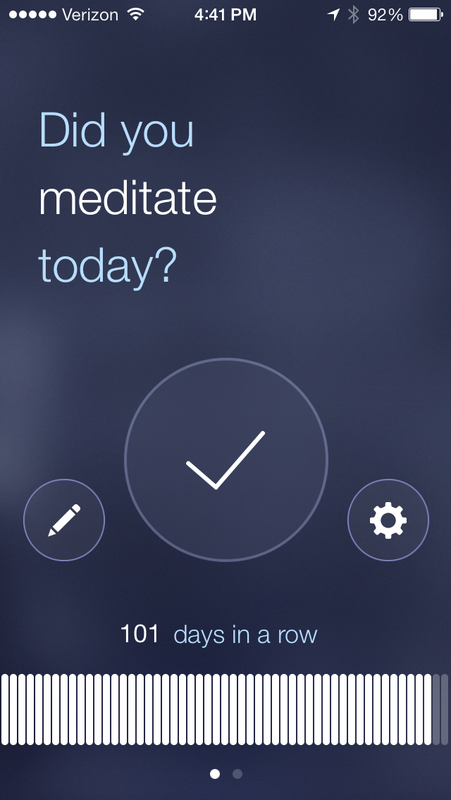 I need to meditate in the morning as part of my routine. If I slack off and jump right onto my computer, I’ll put my habit off until the evening when I’m worried about cooking dinner and wearing my dogs out. At that point, I usually just cram it in to say I did it. It’s helped me to track how many days in a row I’ve been on track. I’m using Commit. Once I got past about 10 days, the last thing I wanted to do was break the chain. Now that I’m over 100, that’s motivation itself to stick with the habit for just one more day.